After visiting and working in various plants across the nation, I’ve noticed that most small reservoirs just don’t receive the attention they deserve. At one facility, we focused heavily on larger equipment that was deemed critical. Typically, these were also high-dollar items to replace or rebuild, so we made sure they were retrofitted with breathers, sight glasses, quick connects, inspections, etc. When smaller equipment failed, like a pump or gearbox, it usually was a firefighting situation because it was holding up one of our processes. At that point, we took the time to review the application and added preventive maintenance (PM) and inspections into the system. Eventually, everything was fed into our database, and some type of PM or inspection took place. All new equipment was also reviewed thoroughly to ensure past troubles were not repeated. The result was a huge increase in uptime, productivity and machine availability. The ultimate goal with larger equipment is to predict and schedule when it will need to be replaced or repaired before a catastrophic failure and costly downtime occur. But what should be done with smaller pieces of equipment, those with reservoir capacities of only a few ounces to 10 gallons, or machines on which oil analysis is not conducted? How do you keep these systems in good condition? Regular inspections will make it easier to detect early warning signs of future problems. For example, a simple oil level check can be the difference between a piece of equipment failing prematurely and running five to 10 years or more. It doesn’t end there. If the oil level is recorded as low, the reservoir must be topped up, but how is this top-up performed? Everyone has a slightly different way of completing this simple task, which can have negative effects on your machinery if not done correctly. not cleaned or has spouts that are not kept closed. Let’s start by examining some of the wrong ways to top off your reservoirs. Please note that these practices also apply to changing out the oil in your equipment regardless of whether it is a gearbox, pump or other oiled component. I have seen funnels used everywhere and anywhere. Now I’m not saying that utilizing a funnel will kill your machinery, but how you treat the funnel and how the funnel is used may. Funnels often collect dust and debris while stored in lockers or the back of utility vehicles. Frequently after use, they are drip-dried and thrown into a storage location until needed again. Someone then pulls out the funnel to top off a reservoir and may or may not give it a quick wipe before pouring oil through it. You can imagine how much dirt is distributed into the reservoir just from the funnel alone. I cannot count the number of times I have spotted open oil-transfer containers in a plant. In my first maintenance job, these types of containers were the only ones used to transfer oil. I’ve actually witnessed 5-gallon buckets with visible dirt and oil inside them just waiting to go into a machine. Keep in mind that large particles that enter a sump will eventually be made into smaller particles, which will have detrimental effects on the machine. Galvanized pails have a coating of zinc to protect the steel. The problem with this zinc coating is that the additives in the oil formulation will attach themselves to it and get stripped from the oil before entering the reservoir, decreasing the percentage of beneficial additives in the oil. 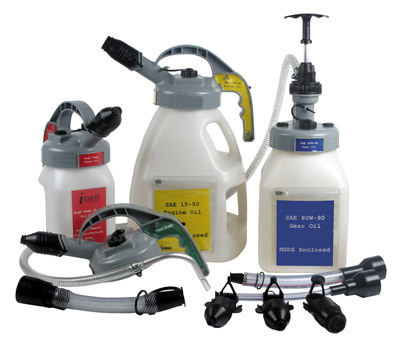 If handled correctly, a sealable and reusable (S&R) container is great for transferring oil and topping up equipment. However, problems can occur if the containers are not labeled or cleaned, left in the field next to equipment, or have spouts that are not kept closed. This will largely depend on the individual who is adding the oil. With small reservoirs, it often is not economical to add quick connects as a means to fill and drain the system. Removing a fill plug or breather may be the only way to get oil back into the system. Unless you have an air-tight production facility with excellent filtration, debris will settle on and around fill ports and be ready to introduce itself once the ports are opened. There’s a misconception that new oil is clean oil. This isn’t always the case. Generally, oil that is received in drums, pails and bulk tanks should not go straight into your equipment. After sampling multiple drums of new oil deliveries over the years, I’ve found that a barrel of oil that meets the equipment’s cleanliness targets is like finding a unicorn. Occasionally, a delivery may come in that meets the specifications, but you should always filter the oil before any top-up or fill is performed. Too often I’ve seen a piece of equipment be put into operation and never be looked at or thought about again. Simple daily or weekly inspections should be performed on any valued asset. Over time, seals can begin to wear and leak. A plug may not have been tightened properly or has become loose. Small bath systems depend on the oil level being correct. Now let’s address the bad practices outlined previously by explaining how to correct them. Some are fairly straightforward, while others will require an investment of time, money and training. I don’t think all funnels are bad. They have their place. I personally use a funnel every time I change the oil in my vehicles. But what are the best practices for using a funnel? First, make sure it’s clean before using it. Clean the inside and outside with a lint-free cloth. After using the funnel, clean it again and store it in a new zip-lock bag, which should then be sealed and put in its permanent spot. This is important. I swear my wife and I play this game at our house where I take the scissors out of one drawer and place them in another drawer after I’m done using them. This causes her to search for them or ask me where I put the scissors. If you apply this to an industrial setting where multiple people have access to the tools, you would never be able to predict where the funnels would be. This typically leads to someone grabbing a funnel or something else that is unfit for use. Quit using these containers. Do an inventory check and throw all of them away. Purchase enough S&R containers to get your team accustomed to using them. If the right tools are readily available, good practices will follow. Also, train the individuals who handle lubricants so they know not to use bad practices. These containers should not be left lying around the plant. If a container is not where it’s supposed to be, it will be of no use to the next person who needs it. Put a PM in place to thoroughly clean the inside and outside of the containers. This should be done inside a clean room to prevent contamination from entering the newly cleaned container. Just as with funnels, use a lint-free cloth to help with cleaning. Bring rags or wipes with you to the field to aid in cleaning fill ports before opening them. Even a little dirt entering the system can lead to catastrophic results. Having a supply of rags or wipes with you will help make those quick level inspections more reliable. All oil entering the facility should go through a decontamination process before being allowed to enter a machine. 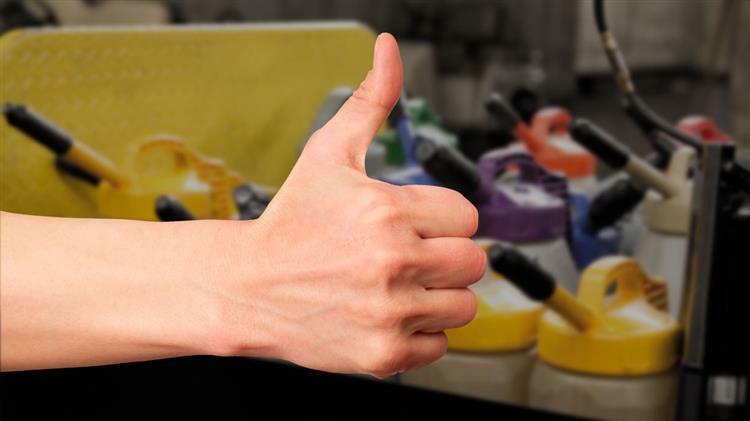 Target cleanliness levels should be defined for all equipment, even if oil analysis isn’t going to be performed. Optimum equipment reliability can be expected when new oil is at the target specification or cleaner. All machinery should be examined at some point. A simple level inspection could mean life or death. It doesn’t take much fluctuation of the oil level in most small reservoirs to start seeing a negative impact on the internal components. Put PMs and inspections in place so they become standard practice for servicing the “forgotten” equipment. Although this was not addressed directly in the bad practices, it is critical to maintain a precise oil level in small reservoirs. 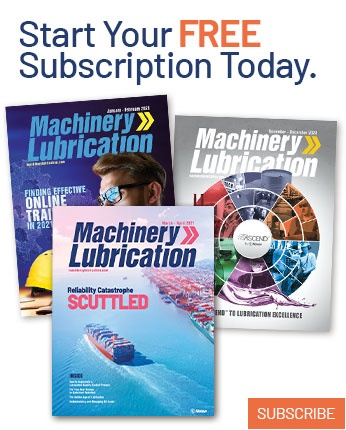 Underfilled units can lead to lubricant starvation and machine failure. Overfilled sumps can result in unnecessary seal leakage or foaming of the oil. Even a monthly inspection is better than nothing. Most manufacturers will specify how much oil the reservoir should take. The proper oil level should also be clearly identified on the sight glass. A good sight glass will aid in maintaining a precise oil level. Before an inspection, the sight glass should be cleaned for an accurate reading. Newer sight glass styles allow a 360-degree view of the oil level, which can yield better inspection results. A bottom sediment and water (BS&W) bowl may also be helpful. It can offer telltale signs of water contamination, sludge or wear. If oil analysis is not going to be performed, this simple device can provide an early detection of potential problems. Along with cleaning the oil before it goes into the machine, there must be a way to control the environmental elements. Proper headspace management will be key. In humid places, washdown applications or even outdoor equipment, a desiccant breather is an excellent option. While particle contamination is the No. 1 cause of lubricant-related equipment failure, moisture should not be overlooked. 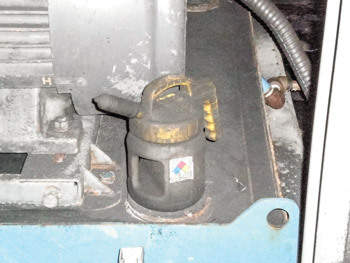 If moisture is not a threat to your machinery, a particle breather may be used. However, not all headspace management is created equal. Look for the micron rating to confirm that the breather you select will provide the needed protection. It’s uncommon to sample smaller reservoirs simply because the cost may be comparable to or more than an oil change. Still, less periodic sampling can offer certain benefits. For example, I had a set of 20 gearboxes that required a synthetic lubricant. With all the gearboxes the same, I wanted to see if extending the oil change interval from one to two years would be possible. By collecting a few drain samples from the gearboxes, I was able to prove that the drain interval could be extended. At other times, the piece of equipment may be critical. If frequent sampling is to occur, hard sampling devices should be installed for more consistent results. Having the right tools for the job makes it that much easier. Sometimes a funnel and an S&R container just aren’t enough. For harsh environments, a quick connect should be considered. Quick connects can be retrofitted to an S&R container for easy filling. This greatly reduces the number of contaminants that enter the system while filling. While all these tips can help any plant keep its smaller reservoirs topped up, it eventually boils down to the people performing the work. Without proper training, the same bad practices will continue because the individuals don’t understand the impact they have on the equipment’s reliability. 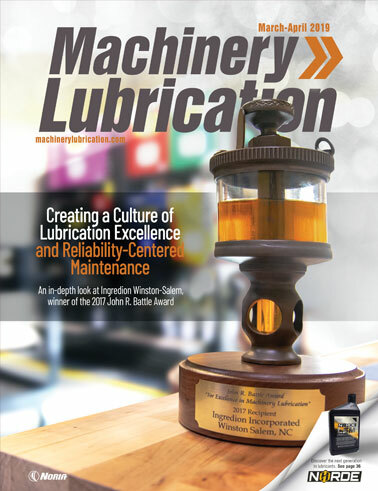 If your organization relates more to the bad practices than the good ones, it’s time to step back and re-evaluate the way you manage lubrication. It’s not a total loss. There is hope. 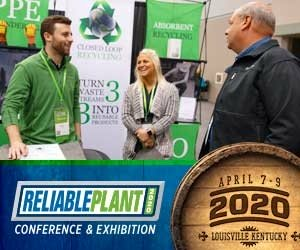 Take a look around your plant and talk with the individuals on the floor doing the work. Develop a plan and address some of the bigger outlying issues. Remember, it’s not always the critical equipment that holds up production.